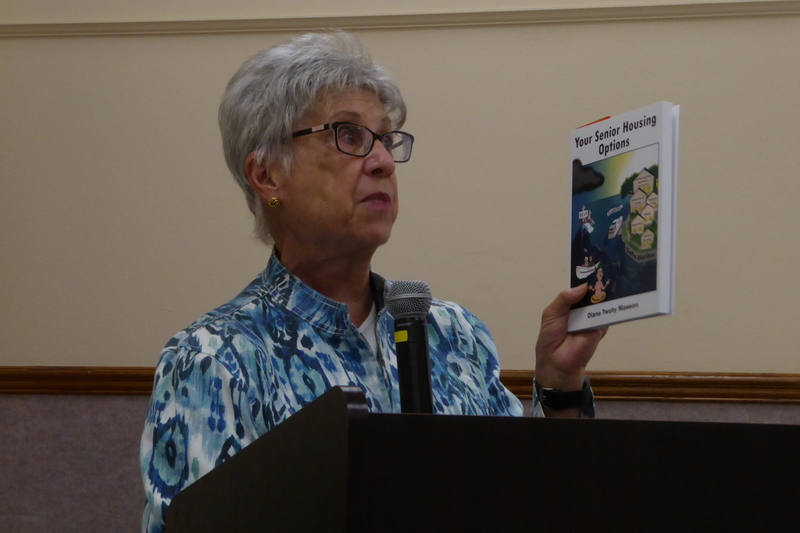 The meeting was opened at 2:09 pm by Club President Catherine Brians, who welcomed attendees and introduced Marion Levine (left, showing speaker Diane Masson’s book) who, in turn, introduced the panelists for the afternoon. 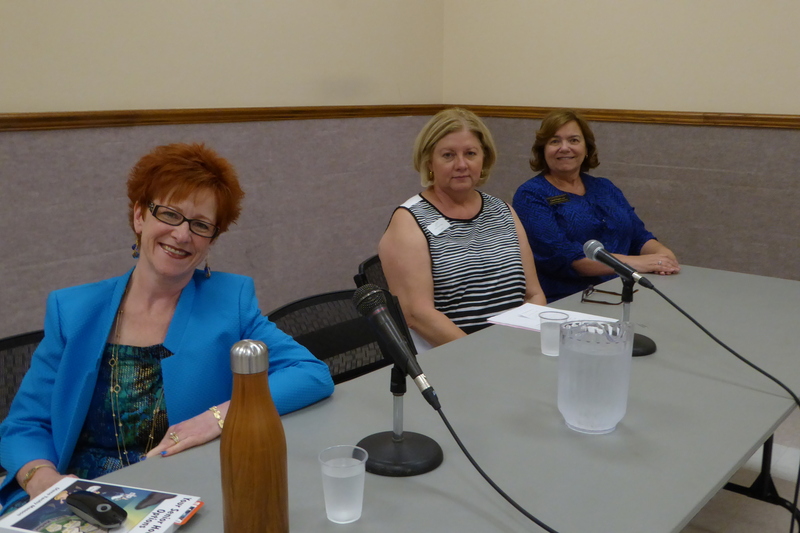 The meeting topic was “Caregivers and Senior Housing.” The speakers (shown below, from left) were Diane Masson, senior care consultant, Village resident, and author of Your Senior Housing Options. She was followed by Laura Boucher, a social worker at the Laguna Woods Village Senior Services Department, and Carol Tryon, a staff member of the new Alzheimer’s Orange County Adult Daycare Center. 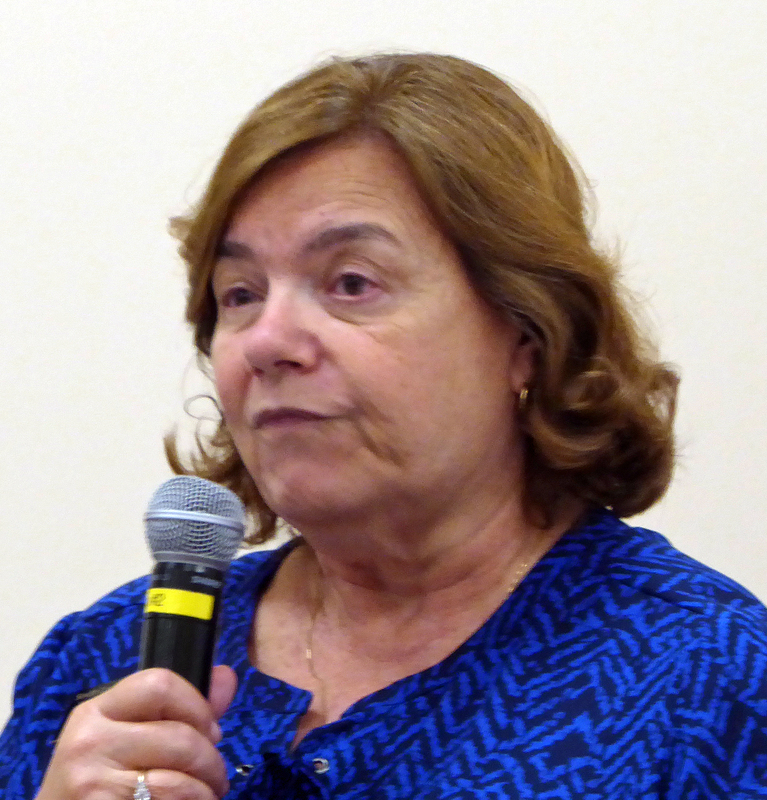 Diane Masson (shown in photo at top of page) spoke about the need for seniors to have a plan for their future rather than wait for a crisis which may cause them to make uninformed decisions. She reported that 66% of seniors will need assisted/skilled nursing in their lives and 20% of them will need this nursing for more than 5 years. A question we should be asking ourselves is whether our own home is the best place to be at such a time. 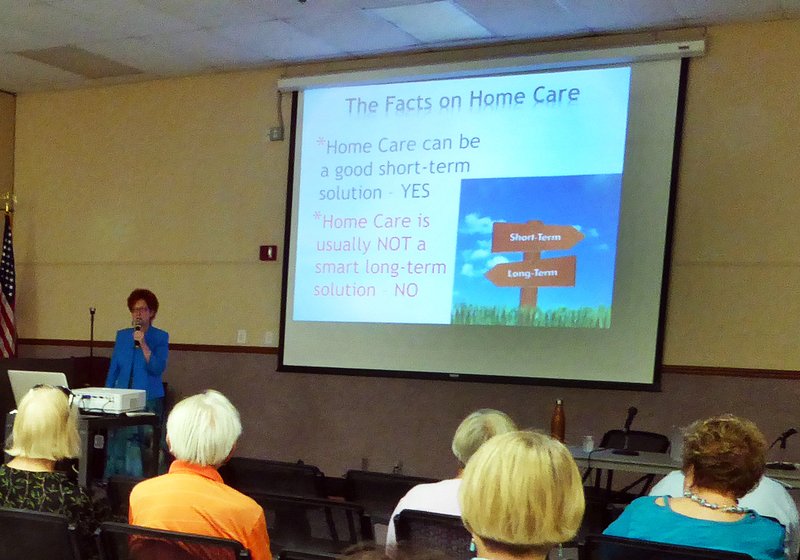 Homecare – can be a good short-term solution and costs an average of $10,000 – $15,000 per month for 24/7 care. The senior is responsible for making sure the caregiver is covered by liability insurance and must pay payroll taxes, etc. Independent Rental Facilities which usually cover liability, taxes, etc. and costs $5,000 – $7,000 per month. When researching rental facilities, ask for maximum care costs. Skilled Nursing Facilities usually cost about $100,000 per year. In many cases, Medicare and supplemental insurance will pay a portion of these costs. Long-term Health Insurance will also cover some of the costs. Diane’s book covers all the options and the questions a senior should ask when searching for alternatives. 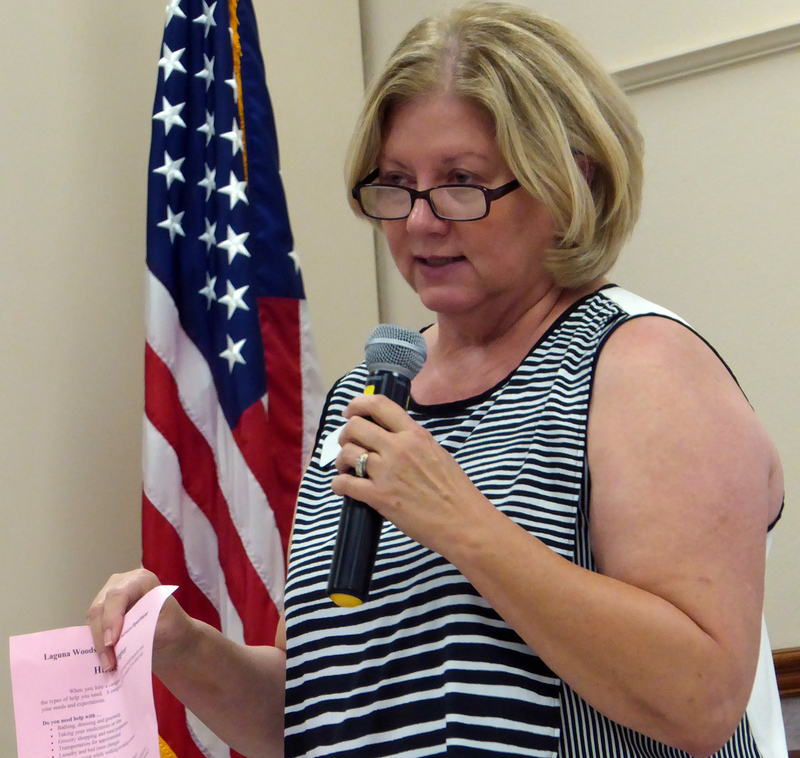 Laura Boucher reviewed the services and information resources that Village residents can receive from our own Social Services Department. They have lists of licensed caregiver agencies registered with the State. 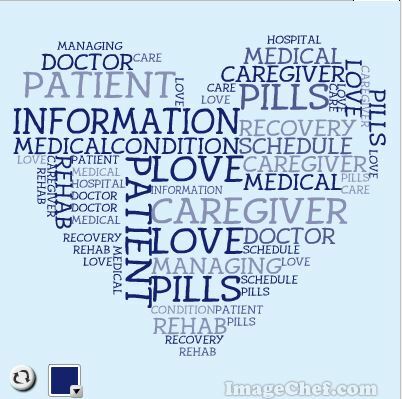 They also have a list of questions a resident should ask when searching for a caregiver. 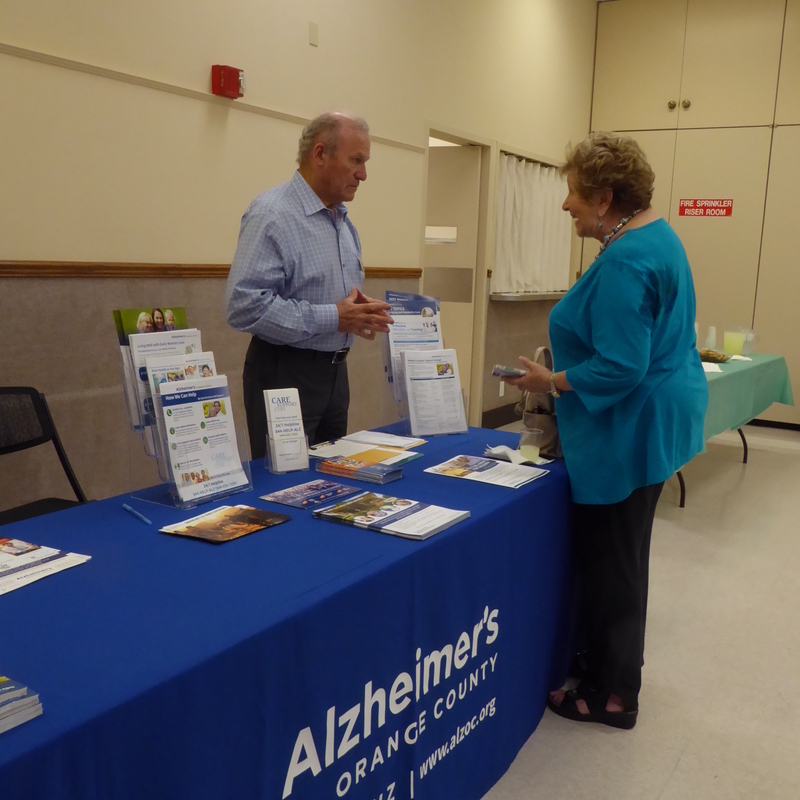 Carol Tryon covered the services of the new Alzheimer’s Orange County Adult Daycare Center located on El Toro Road, near Laguna Woods Village. She also spoke of the new respite care program, underwritten by the Foundation of Laguna Woods Village, which allows caregivers to place their charges in a safe space for a couple of hours so that they can have a respite from the stress of the continual caregiving. A question and answer period followed along with the availability of brief personal consultation and the distribution of printed information from each of the speakers. There were 33 attendees at this meeting which ended at 3:17 pm.